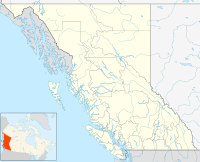 Burton is a settlement on the Arrow Lakes in the West Kootenay region of southeastern British Columbia, Canada. Before European contact, Burton was known as xaieken, a large village of Sinixt first nations people. There are claims by several First Nations about the area and although inadequate archeological research exists "Most of the cultural sites listed are connected to the Sinixt/Arrow Lakes Interior Salish tribe" https://ourtrust.org/wp-content/uploads/downloads/CBT-Built-Heritage-Inventory-Final.pdf Burton came to be in the 1890s when gold was found at Cariboo Creek, a steamboat stop. Miners and farmers moved in and development began. Served by CPR sternwheeler boats for many years until 1954, BC Highway 6 is now the main means of access. Tug boats still ply the lake towing log booms and barges. The original townsite was flooded out in the 1960s when the Keenleyside Dam was built on the Columbia River near Castlegar, British Columbia which raised the level of the river, with the result combining Upper and Lower Arrow Lakes into one large lake, almost all the way to Revelstoke over 100 miles to the north of Castlegar. A new town site was established on higher ground at that time. The old town site had 4 stores, gas stations, cafe, school, playing fields, a community hall, a large Federal gov't wharf, a hotel with pub and three churches. The old townsite was north of the mouth of Cariboo creek with farms north, south and east of the townsite. A scenic location surrounded by mountains with lake, creeks and wildlife close at hand. ^ "Burton". BC Geographical Names. Retrieved June 25, 2017. This page was last edited on 30 September 2018, at 15:27 (UTC).